Last week I read something very exciting. It was a review of a book that I hadn’t read, nor did I know the author in any real way. Here it is. What was exciting was in the way that the writer absolutely ripped the work to shreds. The review was funny, intelligent, and somehow apologetic in the way that the reviewer went about his surgical eviscerating. As if he didn’t really want to be doing what he was doing, but owed it to the public to reveal the fraudulent and shameful creation he’d been forced to read and critique as a blatant example of a contemporary Emperor’s New Clothes hoodwink by the incestuous cabal that controls big book publishing. The attitude reminded me of that wonderful quote from Ted Knight playing Judge Elihu Smails in Brian Doyle Murray, Harold Ramis and Doug Kenney’s masterpiece Caddyshack. I’ve sentenced boys younger than you to the gas chamber. Didn’t want to do it. I felt I owed it to them. I doubt Dwight Garner, the author of the review, felt he owed Bill Clegg (the author of the book) anything. What Garner owed the readers of The New York Times, though, was all of the backstory behind his review. The stuff that experienced book-publishing people like myself know simmers beneath every bit of ink any book receives. What I mean is the context of what the book represents. Not what it actually is or where it sits in its chosen genre/s. This is the stuff (the backstory of the writer) that made a lesser part of myself—the envious and snarky and pathetic part that roots for other people’s failure—so excited. And I suspect the story behind the book is also what drove Garner to such vitriolic scorn of an original creation that’s obviously just not his cup of tea. After reading the thing (the review, not the book which isn’t in a genre that floats my boat) a few times, I think Garner should have passed on reviewing the book altogether. Or at the very least he should have found a different “take” on it that would have meant more than “this book is stupid and I hate it.” Instead he reviewed the hype about the book in the guise of warning people off from poor writing. Please. Give me a break. Poor writing? The fact that Garner was able to pull out a bunch of phrases in Clegg’s book that are repetitious and cheesy doesn’t mean much. You can find poor writing in anything if you look hard enough and are a good enough writer to frame it as such. And Garner is a terrific writer. Which makes the backstory about Clegg all the more important to reveal. Before I launch into the Clegg story as I know it, I’ll just say that I’ve only met him once…and it was at a dinner party probably fifteen years ago for a duration of about sixteen seconds. I doubt we traded more than four words between us. But because big book publishing consists of probably 500 people in totem and is spent lunching and drinking and coffeeing ad nauseum within that small universe, everyone knows about everyone else and everyone has an opinion about everyone else. And if you don’t have one, someone will give you his or hers whether you wish to hear it or not. It’s like high school. Here are the facts of the backstory behind the publication of Did You Ever Have a Family (I confess that the fact that there is no question mark in the title bothers me). Bill Clegg is a very successful literary agent who has a stellar list of clients and now has his very own shop called The Clegg Agency. The not too subtle subtext of that is that he has a healthy personal bank account. Clegg went on a crack binge that destroyed his company and his relationship with Burnes. Burnes shut down the company and went to work with David Gernert at The Gernert Company and is doing great. He wrote a memoir about his crack problem called Portrait of an Addict as a Young Man. The co-head of the book department at the William Morris Agency, another powerful literary agent named Jennifer Rudulph Walsh, successfully sold the book and another follow up memoir about Clegg’s recovery to Little Brown for a reported $600,000 two book deal. The two books, the second one was called 90 Days, came out and were well reviewed and sold well too. Last year, Clegg’s first novel was sold at auction by Jennifer Rudulph Walsh for a reported seven figures. All of Clegg’s works have gotten extraordinary review attention. And his personal story (rube from small town makes it in big city literary world, throws it all away and then has a comeback) is of that post-modern American variety (rise-fall-resurrection) that has proven rather irresistible to the media industrial complex since Elvis’s comeback concert on NBC in 1968. Hell, Richard Nixon road that same story into the White House in 1972 and Robert Downey Jr.’s done pretty well with it too. Clegg’s also extremely photogenic and looks as if he’s walked straight out of a John Cheever story. Which is nice. Okay. Those are the facts. Now say you work in the same industry as Mr. Clegg. And you’re a pretty darn good writer or agent or editor or publisher or whatever yourself. But for some unknown reason, you have just never received much attention. Certainly not seven figures worth of acclaim. You’re sort of the mule in the barn that does all of the plowing and keeps the farm afloat, while the prize horse in the platinum stall is the animal everyone wants to visit and appreciate. It seems that every time the horse relieves himself, there are gold buckets that arrive to catch his effluvium, which is repackaged and sold to the hoi polloi as precious discharges of genius. All you and your fellow equine proles can do is commiserate over grogs of $2.00 draft beer at Maggie’s Farm Bar and Grill about the injustice of the show horse that lives extravagantly and never gets a comeuppance. Hmm, can you see where this is going? 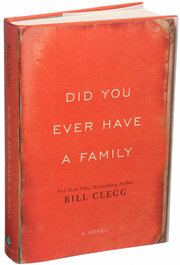 So Mr. Clegg’s first novel excites a number of publishers and it’s sold for a sizable advance. The book is so wonderful to his publisher that she starts a brand new imprint dedicated to “literary fiction” in order to showcase it properly. Press releases are written! Profiles of the author are pitched with very nice photographs of Mr. Clegg enclosed! The pre-sell of the book is on! Remember that book publishing is a teeny tiny community. What do you think happens when a book is called brilliant and amazing and the next big thing for month after month after month before it goes on-sale? The reviewers who have been begged and prodded and lunched to death to pay attention to said book start to get seriously sick of it. They’re tired of all of the Hosannas about this damn prized horse with his big advance who has written this thing that they’re supposed to genuflect about in print. But they can’t just “not cover it” now. Every other big newspaper and online site is going to write something about the damn thing…if they don’t, then their paper will be considered “out of it…not on the cutting edge of the culture.” This is why every fall round up of books (and movies, and music, and plays etc.) is pretty much the same. The fear of being unique isn’t just for kids in seventh grade. So if you’re Dwight Garner or Shawn Coyne for that matter and you follow book publishing, do you think this stuff starts to get on your nerves? Do you think to yourself it’s time that someone tell the truth about this poseur? This guy who gets more acclaim than I? I think that’s what happened in Garner’s review of Did You Ever Have a Family. All of this stuff about Clegg just riled him (whether consciously or subconsciously) and he attacked the book as a way to attack Clegg and the system he came from in response. What could he have done instead? Well, how about reading Clegg’s book and then putting it into perspective? That is, what about thinking about where the book sits in the world of its particular Genre and then if you think it comes up lacking for that particular Genre, how about explaining why exactly. Why isn’t it one of the best books on metabolizing grief ever? What does it compare to? Who actually wrote a better book than Clegg? How as it better? See what I mean? Say, as Garner suggests, that the novel is in the Love Story by Erich Segal or Message in a Bottle by Nicholas Sparks arena. I don’t think it is offhand, but Garner makes that allusion in his review. How about explaining what that particular Genre he’s writing about is all about? And why it might be so popular? I mean Segal and Sparks may not be your line-by-line writing cup of tea, but they have told stories that appeal to millions of people. Isn’t that kind of interesting? What is it about their storytelling that appeals to so many readers? Why do people love novels about grief? I play this parlor game all of the time with fellow book nerds. I think it’s fascinating. Why did Fifty Shades of Grey become such a huge sensation? Does it speak to some primal need/desire? How about some of that Mr. Garner? Anyway, here’s my bottom line. And it’s one, like a lot of things I’ve discovered, that was best epitomized in a story. Chuck Yeager: Monkeys? Think a monkey knows he’s sitting on top of a rocket that might explode? These astronaut boys, they know that, see? Well, I’ll tell you somethin’ – it takes a special kind of man to volunteer for a suicide mission, especially one that’s on TV. Ol’ Gus, he did alright. It’s not easy to write a book. It might not be a suicide mission, but I’ve seen it destroy a lot of people in my day. Let alone THREE books, two of which open the kimono of your darkest self. The most sparkling mule metaphor I’ve ever read — suitable for framing. Terrific post! Thanks for the back story and for calling out Mr. Garner – his clever writing doesn’t hide the mean-spiritedness of his review. Given all that Mr. Clegg has been through, he’ll surely survive Dwight Garner too. Thank you, Shawn. This is beautifully said and full of heart. I so appreciate it. Whenever I read a snarky, clever, destroying review, I think this critic doesn’t know just how utterly damaging to an artist a single review could be and how hard it is to create any work of art, even a terrible one. It’s one thing to give our damning opinions around the dinner table, but quite another to publish them. Let’s save those for the real tyrants out there in our world. Strangely enough, Garner’s review made me want to read the book. I like Erich Segal/Nicholas Sparks “squish.” As Garner listed the things he didn’t like, I checked them off in my mind with a “sounds good to me” checkmark. When I read the rest of Shawn’s post, I REALLY wanted to read the book. Anyone who survives what Clegg survived is awfully special in my books. I want a review to help me decide whether or not *I* would like the book, *not* to tell me whether or not the reviewer did. Open the kimono onto your darkest self. Love that line. Thanks, Shawn.